Ontario announced the New Ontario Student Grant starting in the 2017-18 school year. Students whose parents make a combined household income of less than $50,000 per year can have a tuition free. The grant is only applicable to full-time only. OSAP is Ontario Student Assistance Program that provides financial aid to students and families to help them finance their college or university education. Now students whose parents make a combined income of $83,000 per year or less can get grants from the government of Ontario. Also, the government is now providing additional financial support to full-time mature and married students that are grant approval isn’t tied to how long a student has been out of high school. These changes have brought a considerable relief for mature students who are planning to go back to school to pursue a career. Students whose from middle and upper-income families now have more access to interest-free and low-cost loans through OSAP, and ensuring no eligible students receives less grant money under the Ontarian Student Grant than they previously would have under the 30% Off Tuition Grant. The government also caps the maximum OSAP debt level at $10,000 for an academic year. Parents and spouses’ contribution to the costs of college/university starting in the 2018-2019 school year is also being reduced. One of the reasons for these changes is that the Minister of Training, Colleges, and Universities, Reza Moridi aimed to simplify and modernize the system. “When I became minister two years ago - and I have four university degrees - I found it very difficult to navigate the system,” said Reza Moridi, Minister of Training, Colleges and Universities. 1 “We wanted to simplify it and modernize the system so that students and parents can understand it.” 1 However, some argue that there is not much different than the previous system used. The New Ontario Student Grant is not the same as a free education system in Finland where no tuition fees are charged. 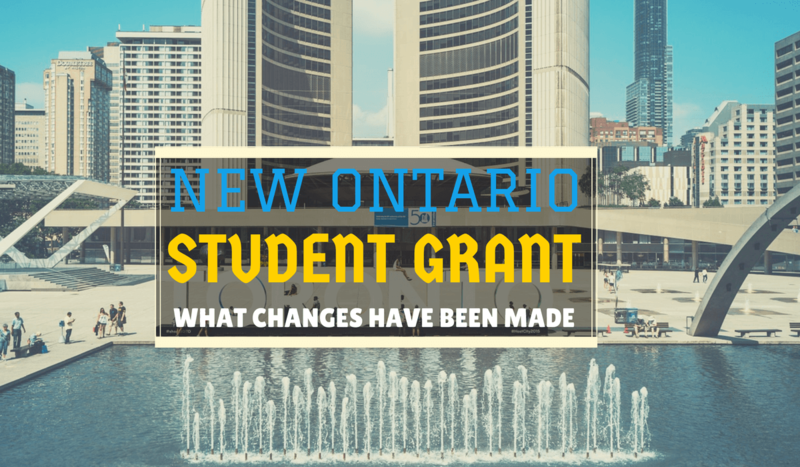 Under these new changes, the parents or students should know what to expect when it comes to applying for Ontario Student Grant. Students should not rely on Student Grant only but seek other alternative funding too such as scholarships and bursaries. Find scholarship for college students on ThePensters and win $1000.